Urban soils are large pools of carbon, nitrogen, and other elements, supporting plant growth, sustaining biogeochemical cycles, and serving as the foundation for maintaining ecosystem function and services of urban green spaces (UGS). Quantifying urban soil properties is essential for assessing urban ecosystem services and detecting pollution. Characterizing spatial heterogeneity of urban soil properties, which may change with land use or urbanization, is crucial for understanding urban ecosystem functions. We collected 466 soil composite samples across the Beijing metropolitan region and then analyzed the heterogeneity of soil properties in UGS of Beijing metropolitan region by ANOVA along the urbanization gradient spanning different land uses. Our results show that soil properties vary considerably among land-use types and along the urban-rural gradient. Soil moisture content, soil organic carbon (SOC), available phosphorus, available potassium, total nitrogen (TN), the ratio of SOC:TN (C/N), Pb, and Cu increased notably from suburbs to the urban core, while soil pH, bulk density, TN, Cr, Ni, and Mn were not significantly different across urbanization levels. 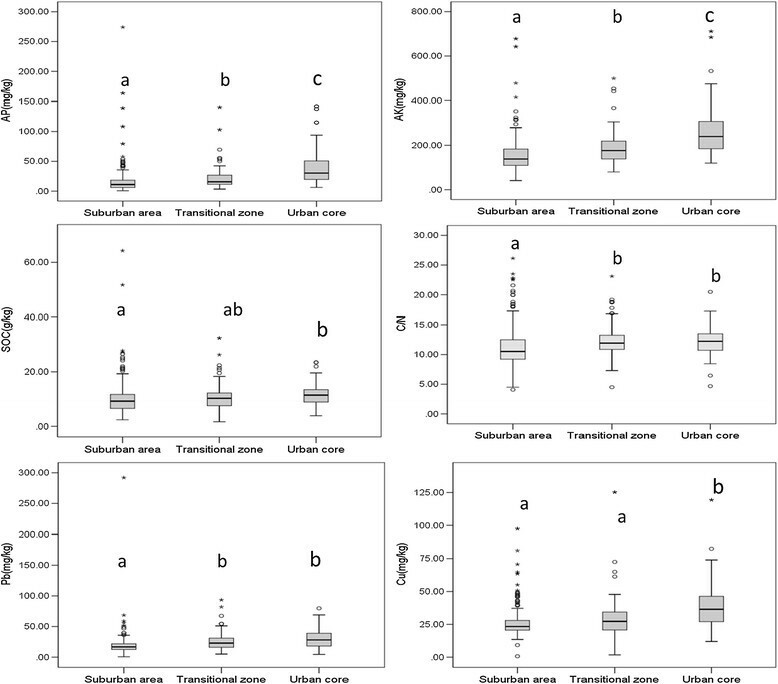 Most soil properties, except soil TN, Cu, Cr, Ni, exhibited significant differences between different land uses. The highest levels of soil nutrients and heavy metals were found in roadsides and residential areas among all the land uses. The spatial heterogeneity of urban soils in the Beijing metropolitan region is mainly attributable to the different land uses. Soil nutrient content has increased in UGS due to fertilization and pollution. Contamination of urban soils by heavy metals is due largely to traffic emissions and pollution by industrial and household wastes. Although human activities tend to augment urban soil nutrient pools to maximize certain ecosystem services, they may inadvertently compromise these and other services by increasing pollution. Knowledge of urban soil spatial heterogeneity in UGS is indispensable for improving urban ecosystem management. Soil, as the component of urban green spaces (UGS) (Setälä et al. ), plays a pivotal role in maintaining urban ecosystem services, such as biodiversity maintenance, water resources protection, microclimate regulation, carbon sequestration, food production, and fulfillment of cultural or recreational needs (Lovell and Taylor ; Neil et al. ; Wu ). Urban soils are large pools of carbon, nitrogen, and other elements, serving as the foundation of urban ecosystems by supporting plant growth and sustaining biogeochemical cycles (Pouyat et al. ). Quantifying soil properties and understanding soil conditions are essential for assessing ecosystem services provided by UGS and detecting pollution in UGS. Urban soils are often physically disturbed, chemically polluted, and tend to be highly heterogeneous spatially (Wu ). Previous studies conducted at regional scales examined soil properties' variations along urbanization gradients of Hong Kong (Jim [1998a]), Phoenix (Zhu et al. ), Baltimore, and New York (Pouyat et al. ). Major findings from these and other studies are as follows. First, urbanization is accompanied by the transporting of large amounts of rock material in the landscape, the introduction of construction rubble, bricks, and other building materials (Jin et al. ). Consequently, urban soils often are compacted and structurally degraded, alkaline, and water deficient (Jim [1998a]), which makes them less suitable for growing plants. Second, existing soil patterns are the product of both human disturbances and management-induced amelioration and therefore the effects of urbanization on soil nutrients. For example, some researcher demonstrated that urban soil had lower nutrients (Jim [1998b]; Baxter et al. ), while other studies pointed out that soil nutrients were higher in urban area (Kaye et al. ) and had sufficient nutrient levels to support plant growth (Pouyat et al. ). Third, pollutants from industrial activities (Shang et al. ), heavy traffic (Chen et al. [2010a]; Hamzeh et al. ), and house wastes (Schwarz et al. ; Szolnoki et al. ) all contribute to soil contamination by heavy metals, which is likely to have adverse effects on human health. At local scales, urban soil properties were compared between different land uses in a number of cities, including Baltimore (Pouyat et al. ), Hong Kong (Jim [1998a]), Hubei (Li et al. ), and Lanzhou (Wang et al. ). It is widely agreed that the difference in human activities contribute to the variation of soil properties among land-use types (Pouyat et al. ; Davies and Hall ). For example, soils in transportation and residential areas were characterized by higher pH and bulk density (BD) (Pouyat et al. ; Zhao et al. ; Yang et al. ). 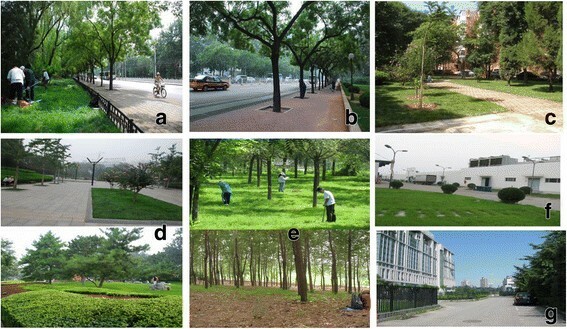 Soils in urban forests (Zhao et al. ) or protected places (Yang et al. ) contained higher soil organic carbon (SOC), while soils at industrial sites and in transportation areas were often polluted by heavy metals (Lu and Bai ; Hamzeh et al. ). At finer scales, urban soil carbon and nitrogen also varied within single patches, although this variation was smaller than that at broader scales and different land uses (Jenerette et al. ). Previous investigations undoubtedly suggest significant transformations in urban soil properties as a result of land use and land cover changes. However, a deep understanding of the urban soil biogeochemistry is still limited, requiring more research to be conducted. Considerable spatial heterogeneity of urban soils warrants a landscape ecological perspective for analyzing patterns and determinants of soils in urban areas. 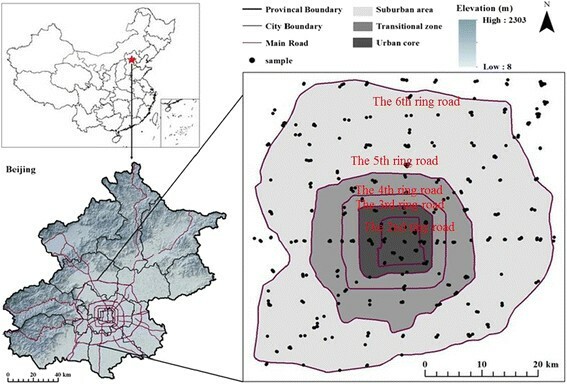 We therefore investigated urban soil variation in UGS of Beijing along the urbanization gradient and across different land-use types in order to understand this heterogeneity. Specifically, we focused on three questions: (1) What are the soil properties in UGS in Beijing and do they meet the needs of plant growth or not? (2) How and do soil properties vary along urbanization gradients or not? (3) How and do soil properties vary across land-use types or not? Our findings are expected to have implications for a better understanding of urbanization effects on soils and contribute to scientifically informed soil management and conservation in UGS. Beijing, one of the oldest cities in the world which has experienced rapid urbanization in the recent decades, was chosen for our case study. It is located in the northeast of the North China Plain and has an area of approximately 16,410 km2 and a population of 20.69 million (Beijing Municipal Bureau of Statistics ). During 1984 and 2008, the urbanized area in Beijing increased 3.4 times (Kuang ), while permanent residents increased by 53.4% (Beijing Municipal Bureau of Statistics ). Beijing has diverse land uses including residential (52.64%), wood (7.04%), institutional (6.83%), industrial, and commercial (4.62%), transportation (2.91%), and others (Kuang ). Such degree of urbanization and variability of land-use types makes Beijing a good study site to address our research questions. In July 2009, we set up eight transects from the urban core to suburban areas in eight directions (east, west, north, south, northeast, northwest, southeast, southwest) in order to capture urbanization gradients. Along these transects, 78 survey plots spaced at 3-km interval were selected. Another 52 plots at 6-km interval were later added to densify our sampling network and capture more of the spatial heterogeneity. Consequently, 130 plots were sampled (Figure 1). We recorded dominant land use within the 500-m radius of each plot. One composite surface (0 to 20 cm) soil core was obtained within a representative 20 × 20-m open space by mixing three cater-cornered subsamples. Three additional samples were collected by cutting rings and then transferring them into three aluminum boxes. A total of 466 soil composite samples were collected during July to September. Study area and soil sampling design. Soil samples were stored indoor and dried at room temperature. Debris (e.g., leaves, stones, worms) were handpicked and removed. The samples were then grounded to go through 2-, 1-, and 0.15-mm nylon sieves, respectively. Laboratory analyses for soil properties were then conducted using soil composites through different nylon sieves. Specifically, we analyzed the soil moisture content (SMC), soil pH, soil BD, total nitrogen (TN) content, SOC:TN (C/N), SOC, available phosphorus (AP), available potassium (AK), and heavy metals (Pb, Cr, Cu, Ni, Mn). All laboratory tests followed standard methods. Using soils from the aluminum boxes, SMC was determined by drying them at 105°C for 24 h and was calculated as the percentage of water in oven-dry soil (%). BD was determined from the total oven-dry mass and was calculated as milligrams of oven-dry soil in the volume of 1 cm3. Using soils through 2-mm nylon sieves, pH was measured with a 1:2.5 mixture (soil:water ratio) by the glass electrode method (McLean ). Using soils through 1-mm nylon sieves, we measured AP by Mo-Sb colorimetry from a sample extracted with NaHCO3 and non-phosphorus active carbon (Tiessen et al. ), while AK was extracted with ammonium acetate and examined directly by inductively coupled plasma optical emission spectroscopy (ICP-OES) (Simard ). Using soils through 0.15-mm nylon sieves, TN and TC were analyzed by the dry combustion method (Vario EL Element Analyzer) (Bremner and Mulvaney ). SOC was measured by potassium dichromate titration method (Lu ). Finally, we measured the contents of Pb, Cu, Cr, Ni, and Mn by extracting them using HNO3, HClO4, and HF according to USEPA method 3052 with a microwave laboratory unit (USEPA United States Environmental Protection Agency ). Pb, Cr, Mn, Cu, and Ni contents were all determined using ICP-OES. Beijing has five circular express roads, which are named as the second to the sixth ring road. The rapid urban sprawl in Beijing followed a homocentric expansion along this ring-road system (Kuang ). We therefore use these ring roads as benchmarks of urbanization phases in Beijing. According to this logic, we define the area within the third ring road as the urban core area, while the area between the third and the fifth ring roads as the urban transitional zone. The suburban area encompasses developments outside the fifth ring road (Figure 1). Seven types of land use in our study. (a) Road greenbelts, (b) roadside, (c) residential area, (d) neighborhood park, (e) forest, (f) industrial area, (g) institutional sites. Statistical analyses were performed in SPSS 21. The Kolmogorov-Smirnov (K-S) test for normality was used to determine whether variables were normal or skewed. Data were log transformed to stabilize the variance of soil properties for AP, AK, SOC, TN, C/N, Pb, Cu, Ni, and Mn. The analysis of variance (ANOVA) was used to test whether soil properties varied between different areas followed by multiple comparisons to test the effect of land-use types and urbanization on each variable. To deal with sample size inequalities for different land-use types or urbanization levels, we employed the Hochberg's method for post hoc analysis to determine significant differences between mean soil variables (Pouyat et al. ). To articulate human activities' impacts on UGS soil properties, we compared our samples with background values of soil properties in Beijing (Su et al. ; Liu et al. ), which were sampled in mountains in the outskirt of Beijing to represent soil properties values without human disturbance. We refer to China's Environmental Protection Agency's work for these background soil values (China National Environmental Monitoring Center ). Descriptive statistics of each soil variable revealed that soil properties in UGS varied widely (Table 1). The highest coefficient of variation (CV) was found in soil AP (119.25%) and the lowest in soil pH (2.36%). aLiu et al. , a study of soil properties in mountain region, Beijing; bSu et al. , another study of soil properties in mountain region, Beijing; cChina National Environmental Monitoring Center , a book of soil background value in China. SE-Standard errors; CV-Coefficient of variation. Comparing our results with soil background values, we found that the mean values of soil pH, BD, and AP were higher, AK, SOC, TN, and C/N were lower, and SMC was similar to that in Dongling mountain in Beijing. Of these, only mean Cu was higher than the soil background value of Beijing (23.6 mg/kg), which signifies relatively clean soils, close to natural soils. Table 2 shows variation of soil properties along the urbanization gradient. Soil moisture, AP, AK, SOC, C/N, Pb, and Cu showed significant increase from suburban area to the urban core (Figure 3). The SMC in suburban areas (16.25%) is not statistically different (P = 0.250) from the transitional zone (17.4%) but both are significantly different from the urban core (20.12%). Soil AP and AK were significantly different between different urbanization levels (P < 0.001), but the difference of SOC was only detected between the suburban area and the urban core (P = 0.012), while the difference of soil C/N was detected between suburban area and other two areas. The soil Pb was significantly higher (P < 0.001) in the urban core and the transitional zone compared to suburban areas, whereas no significant difference of soil Pb is detected between the urban core and the transitional zone (P = 0.659). Soil Cu content was significantly higher in the urban core area when compared to the transitional zone and suburban areas. For soil pH, BD, TN, Cr, Ni and Mn, no significant difference was found along the urbanization gradient. Values with the same letters in superscript are not significantly different at 5% level based on Hochberg's multiple comparison tests. Last column shows P values for ANOVA tests. The soil properties were notably different between land-use types (Table 3). Our results showed that soil pH, BD, SMC, AP, AK, SOC, C/N, TN, Pb, and Mn were significantly different between the seven land-use types (P < 0.05). Detailed results on how each soil property varies across land-use types are listed in Table 3. In particular, we want to point out the following soil property variations across land-use types and will discuss what caused such variation in the ‘Discussion’ section. Values with same letters are not significantly different at 5% level based on Hochberg's multiple comparison tests. Last column shows P values for ANOVA tests. The soil pH, BD, and AP in roadsides and residential areas are significantly higher than in the forests. The soil Mn, SOC, and C/N are higher in roadsides than the rest land-use types. Soil AP is significantly higher in road greenbelts. Our results indicate that soils are practically unsuitable for plant growth in many places within the Beijing metropolitan region. The soils of UGS in this region are commonly alkaline and mechanically compacted. The soil pH in all sites exceeds the pH level of neutral soils (pH = 7), which makes them unsuitable for growing most of plants according to earlier recommendations (Whitcomb ). The high levels of alkaline can influence soil nutrient solubility (Messenger ) and lead to soil fertility imbalance, deficiency, and chlorosis symptoms (Harrell et al. ). Furthermore, measured soil BD was above 1.10 mg/m3 for 98.92% of the samples and 1.49 mg/m3 for 18.2% of the samples, which are expected to affect plant root growth (USDA United States Department of Agriculture ). This is also aggravated by reduced soil moisture holding capacity, aeration, and drainage. Our results also suggest deficiencies in soil AP and SOC. While soil AP in urban sites is almost twice as high (11.67 mg/kg) as the background value (Liu et al. ), it is still lower (less than 30 mg/kg in 82.17% of the samples) than the recommended suitability range of 30 to 60 mg/kg for healthy plant growth (Whitcomb ). The SOC in the urban area (10.51 g/kg) is more than five times less than the background value (62.16 g/kg) (Liu et al. ). Moreover, only 42.25% of the samples are above the recommended range of soil SOC (>10 g/kg) for healthy plant growing (Whitcomb ). Such SOC deficiency in UGS can easily deplete soil structural composition and complicate maintenance (Jim [1998b]). In contrast to soil AP and SOC, AK is found in sufficient, even excessive, quantities in Beijing (176.44 mg/kg), which is higher than the recommended range of 78 to 156 mg/kg for healthy plant growth (Whitcomb ). The negative side of very high AK in about 50% of the samples is the potential imbalance in nutrients, which has consequences for Ca absorption (Hamberg et al. ; Moussa et al. ). The overall health risk of heavy metal pollution in soils of green spaces in Beijing is relatively low whereas some higher localized soil Pb and Cu content exists. Cu in 18.54% of the samples, Pb in 11.23% of the samples, and Cr and Ni in 0.66% of the samples exceed the environmental quality standards in China (35 mg/kg for Cu and Pb, 90 mg/kg for Cr, and 40 mg/kg for Ni). Two out of the 466 samples of Cu and one sample of Ni exceed the second level (100 mg/kg for Cu and 60 mg/kg for Ni). This level corresponds to the safety threshold for human health (SEPA China State Enviromental Protection Administration of China ). Our findings indicate that soil properties change considerably along urbanization gradients, which is consistent with previous researches (Jim [1998a]; Zhu et al. ; Kaye et al. ; Pouyat et al. ) (Figure 3). Human disturbance impacts soil properties in UGS mostly through intensive management and waste discharge. The urban core has significantly higher SMC than the transitional zone and suburban area because UGS in the urban core are intensively maintained and frequently irrigated. Our finding of the increased SMC in the urban core of Beijing echoed the patterns of Phoenix in Arizona, USA (Zhu et al. ). Frequent irrigation and fertilization in urban areas also caused dramatic increase in soil AP, AK, and SOC from suburbs to the urban core (Figure 3), which is consistent with the higher content of soil nutrients in urban soils found previously (Zhu et al. ; Kaye et al. ; Pouyat et al. , ). Direct inputs of pollutants also contribute to such patterns (Kaye et al. ). For example, untreated sewage, domestic waste, and excessive fertilizer applications could all lead to AP accumulation in urban and suburban soils (Huang et al. ). The urban construction, which uses cement and concrete with abundant Ca, is a source of higher surface charge densities and cation exchange interaction. Its most direct consequence is the fixation of absorbed K ions from soil colloids (Li et al. ; Moussa et al. ). Our results show that SOC is positively correlated with the soil Pb (R2 = 0.41, P < 0.001) and Cu (R2 = 0.18, P < 0.001) (Figure 4). This finding is consistent with what researchers found previously that soil organic matter has a positive contribution to heavy metal accumulation (Sauvé et al. ). Correlation of soil Pb/Cu with SOC. Soil pollution by heavy metals (i.e., Pb and Cu) increased significantly along the urbanization gradient (Table 2). The higher Pb concentrations in the urban core are explained by traffic emission and historical use of leaded paints (Chen et al. [2010b]; Xia et al. ). Mao et al. () presented an in-depth analysis on spatial heterogeneity of Pb in Beijing UGS. Three factors contributed to the increase of soil Cu from the suburbs (25.78 mg/kg) to the urban core (39.95 mg/kg) (Figure 3). First, abundant historical sites (temples, palaces, ancient parks) in central Beijing contain many brass cultural relics. Second, Cu is known to be emitted as a result of deterioration of some mechanical parts in vehicles over time. In particular, the lining in automobile brakes was found to the source of Cu (Hamzeh et al. ). Third, application of copper-rich pesticides in UGS may result in an increase of soil Cu in the urban core (Szolnoki et al. ). Most soil properties varied among seven land-use types, and these variations are due mainly to human-induced disturbances, as well as management practices that aim to improve soil conditions. Our results suggest that soils in roadsides and residential areas were most mechanically disturbed and had higher soil nutrients and heavy metal pollutants when compared to other land uses. This finding is consistent with previous findings (Pouyat et al. ; Raciti et al. ; Davies and Hall ; Li et al. ). Close to both streets and pedestrians, roadsides and residential areas are exposed to intense human disturbance, such as trampling, sewage discharge, and pet litter (Li et al. ; Yang et al. ). In contrast, forests in our study are located in infrequently disturbed suburbs away from busy streets and sidewalks (Figure 2e). As a result, soil pH and BD in roadsides and residential areas are significantly higher than in forests. Roadside and residential areas have higher soil AK (P < 0.05). Researchers found that the high level of Ca will increase the level of extractive K and such process is catalyzed by high soil pH (Li et al. ). Construction materials (i.e., bricks and cement) with high Ca content are a major component in roadside and residential areas. Therefore, we speculate that the high K in roadside and residential areas is related to the interaction between K and Ca in an alkaline environment. Soil AP is significantly higher in residential areas, which is mainly due to reclaimed water irrigation in these land uses. Roadsides have the lowest SMC. We attribute this to three factors. First, roadsides are less irrigated than UGS in other land uses. Second, proximity to roads and heavy automobile traffic can increase the ambient temperature and soil evaporation (Figure 2b). Third, higher soil BD decreases soil permeability and water infiltration thus increasing runoff. Roadsides have significantly higher SOC, which can be explained by the following. First, soils in roadsides are seldom disturbed, while other land uses undergo transformations and replacement of vegetation by structures or other vegetation, which depletes SOC. Second, atmospheric deposition from vehicles and high accumulation of dust from nearby sealed surfaces result in increased nutrient content in roadsides (Chon et al. ; Park et al. ; Li et al. ). Third, street litter and animal waste in roadsides may also lead to SOC accumulation (Park et al. ; Zhao et al. ). Similar to SOC, the highest C/N is found in roadsides followed by industrial areas. However, soil TN shows no statistical difference (P = 0.052) between seven land-use types. Soil Mn is also higher in roadsides. Li et al. () also found highest soil Mn concentrations in this land-use type. The pattern can be explained by higher soil temperature near paved surfaces, which promotes soil mineralization and results in higher nutrient content (Curtin et al. ). Soil AP is significantly higher in road greenbelts. We found parts of road greenbelts being irrigated by a mixture of reclaimed water from various urban sewages rich in phosphorous. The highest AP content (274.03 mg/kg) was detected near the steel production factory, the Shougang Construction Group. However, soil Pb and SOC in road greenbelts are relatively low, which is consistent with previous findings (Zhao et al. ). This is because most of the road greenbelts in Beijing were newly built and filled with garden soils and have only experienced a short-time accumulation of soil organic matters and pollutants. Due to limited time and resources, we only measured selected soil properties, while other essential indicators of soil health, such as available nitrogen, micronutrients (e.g., Ca, Mg, Fe), and other heavy metal pollutants (e.g., Cd, Zn, As), were not assessed. Urban soils in the Beijing metropolitan region are considerably alkaline and compacted. Soil TN, SOC, and AP are in deficit, while AK is abundant and sufficient for supporting plant growing. Heavy metal pollution in Beijing is low. Analyses of the spatial patterns of soil properties in Beijing suggest that soil AP, AK, SOC, C/N, Pb, and Cu increase from suburbs to the urban core, while other elements showed no significant difference. Land use was found as a strong predictor of spatial heterogeneity of soil properties. Roadsides and residential areas are the two land uses characterized by higher soil nutrients and heavy metal pollutants. The major factor of soil spatial heterogeneity in our study area is the time of soil accumulation followed by human activities (e.g., physical disturbance, pollutant emissions, irrigation, fertilization, and soil restoration). Our study is an important step toward understanding the spatiotemporal pattern of soil properties in urban regions. Future research should systematically evaluate both the negative and positive effects of management practices on urban soils and help design effective management plans for ameliorating soil conditions. Also, it is critically important to enumerate the different ecosystem services (and disservices) provided by urban soils. This research was supported by two projects - the ‘Special Foundation of State Key Lab of Urban and Regional Ecology (grant SKLURE2013-1-01)’ and the ‘Foundation for The Recruitment Program of Global Experts of Beijing Normal University (257-107023)’. The authors sincerely thank Chunyang He, Deyong Yu, and Zexiang Sun for their valuable input. QM and KM designed the research; QM and SL conducted the research and analyzed the data; QM drafted the manuscript; GH, AB, and JW revised the manuscript. All authors read and approved the final manuscript.